IBM's Watson has been pushing ever further into the business world in recent months, and now it's helping online merchants analyse performance and make better merchandising decisions. Commerce Insights, which IBM debuted earlier this year, now includes cognitive capabilities from Watson Analytics, giving merchants new insight into category and product performance, the company announced on Thursday. 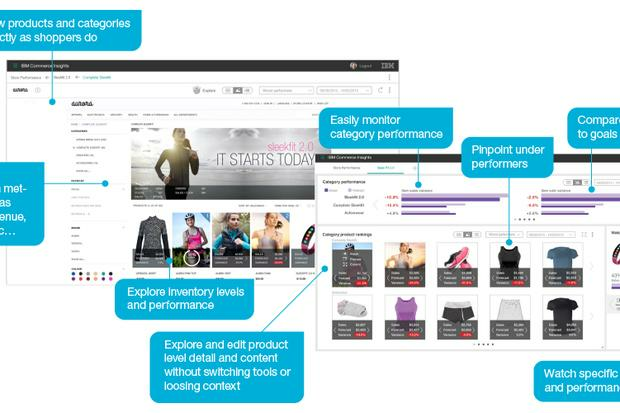 A store view in Commerce Insights overlays customer and performance data on top of the user's storefront, giving online merchants, product managers and marketers the ability to see their products, categories and landing pages as they appear to shoppers along with embedded performance data in a single view. For insights on performance, Watson Analytics can provide a list of several potential starting points. Alternatively, natural language interaction capabilities mean that users can also explore trends in their data using queries made up of their own, everyday words, so no expert assistance is necessary. Faced with disappointing sales in a new line, for example, an online fitness retailer could ask Watson Analytics for more details. Upon learning that mobile traffic to those items is limited in certain geographical areas, the merchandiser could immediately create a new promotion targeting those regions. In general, the new capabilities offer a real-time view into customer behavior and market factors that are affecting a merchant's business, IBM said, allowing companies to proactively identify opportunities and roadblocks and act accordingly. Commerce Insights is now available on the IBM Cloud Shop.